Single head cappers are standalone, inline, screw cappers with a single capping head or chuck. A common example is the Resina Model S-30. If the cap tightening disks are not precisely adjusted, they can slip on the cap. When they do, torques will be inconsistent, the caps will be scuffed and the scuffing will generate rubber shreds which can get under the label making an unsightly appearance. Disk cappers typically position the cap in an escapement, at an angle, and use the bottle to pull it out. Guides help transition the cap from the angle to flat. If not properly set, the cap will not be straight and cocked or cross-threaded caps will result. Some caps, especially those with a large diameter relative to the cap height, can be especially susceptible. Chuck cappers avoid these problems by using the chuck to pick up the cap from a flat position and apply it squarely to the bottle. Bottle and cap are always parallel. The chuck grips the cap positively making it less likely to slip on the cap. This eliminates scuffing and particulates as well as torque issues caused by chuck slippage. In a capper such as the Resina, the chuck spins continuously and reciprocates up and down. Caps are oriented and fed down a track to an angled escapement for pickoff. A horizontally reciprocating transfer arm picks the cap from the escapement and positions it under the chuck. The chuck dips down, grabs the cap and moves up. Meanwhile, the bottle has been indexed into position and held in a gripper pocket to prevent turning as the cap is tightened. As the cap arm moves out of the way, the chuck lowers the cap onto the bottle and turns it down. A clutch breaks free when the correct application torque is achieved. The main disadvantage of these cappers is speed, generally limited to a maximum of about 60ppm maximum depending on bottle and cap. On the plus side, they are generally fully mechanical except for the drive motor and an on/off switch. A single motor drives the machine and all major components operate off cams on the main shaft. This makes them very simple for any mechanic to maintain and makes them a good choice for plants and countries where technical sskill sets are limited. Resina, Model NRS30, automatic, single head stainless steel capper. Rated from 20 to 60 containers per minute – depending on materials, application and machine configuration. Cap size range: 13mm to 120mm. Container size range: up to 6" in Diameter; and 13" in Height (proper change parts required for different size ranges). 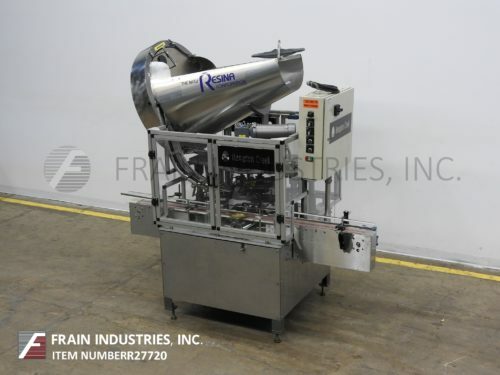 Equipped with cap feeder with H-26 vertical pin dial hopper and sorter with 72" long x 4½" wide stainless steel container conveyor cap chute, transfer shoe, double container grippers, single chuck style capping head and safety guarding. Control panel has conveyor, hopper, capper speed control dials with start / stop push button controls and statis light bar. Mounted on stainless steel base frame. Resina Model S-30, automatic, single head chuck capper rated from 10 to 40 containers per minute – depending on materials, application and machine configuration. Cap size range: 13mm to 70mm, with proper change parts. Containers size range: up to 6" in Diameter; 2-3/4 to 13" in Height. Equipped with 102" long by 4-1/2" wide, stainless steel conveyor, cap hopper with pin wheel sorter, cap chute, cap button and transfer shoe, double container grippers and single chuck. Control panel with start / stop and e-stop controls, product counter and safety guarding. Change parts required to accommodate size range. 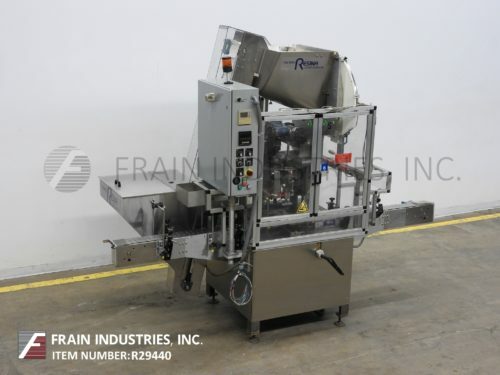 Resina, Model NRS51, automatic, large cap and container, single head chuck capper, rated from 20 to 60 containers per minute – depending on materials, application and machine configuration. Cap size range: 70mm to 120mm and capable of handling a wide variety of large sized and shaped containers with proper change parts. Equipped with motor driven hopper and ring style pin sorter, 84" long x 4½" wide plastic delran container conveyor, adjustable guide rails, cap chute, transfer shoe, double container grippers, single head, air actuated mechanical chuck with boston gear drive and safety guarding. Control panel has conveyor, hopper, capper speed control dials with start / stop push button controls. Mounted on (4) leg base frame. Resina, Model S30, automatic single head chuck style capper. Rated from 20 to 55 containers per minute – depending on materials, application and machine configuration. Cap size range: 13mm to 70mm. Containers size range: up to 6" in Diameter and 2¾" to 13" in Height – change parts required to accommodate different size ranges. Equipped with a 70" long x 4½" wide Delran container conveyor, cap hopper with pin wheel sorter, cap chute, cap button, transfer shoe, double container grippers and single head chuck style cap tightner. Control panel with start / stop push button controls. Mounted on mild steel painted base frame with casters. Resina Model S, single head chuck capper rated from 20 to 60 containers per minute – depending on materials and application. Container size range: 1/2 ounce to 1gallon. Cap size range: 38mm to 110mm and can handle plastic, glass and metal containers (all with proper change parts). Equipped with cap hopper, sorting ring, cap chute, button and chute end, with start / stop and e-stop push button controls and mounted on mild steel painted base frame.